This being our fourth edition of The Windham Eagle, we are getting into our groove. You are obviously familiar with us as our flagship product is delivered to your home in Windham and Raymond every Friday and is now in your hands as you are reading it. We bring it to you in COLOR with pictures and features that remind us of days-gone-by with the intent of improving our today and tomorrow. We are now going to begin rolling out products and services that, I have been told, will make most weeklies in the country envious. Our web editions (yes, editions) will satisfy readers in different ways. Our basic online edition, located at www.TheWindhamEagle.com is what we call our living paper. We use a Blogger format which permits community interaction including your commentary both before and after the printed paper is delivered to your home. There is our “Page Turner” edition for those people that like the feel of a printed newspaper or ebook. This edition allows the users to see an exact copy of the newspaper as it was printed – zoomable for easy reading and, as the name implies, with pages you can turn as if it was a printed sheet. Try it out! It is accessed from the basic edition (www.TheWindhamEagle.com), on the upper right “View our Online Page Turner”. Like us on Facebook to stay informed on what is new and coming in The Windham Eagle (www.facebook.com/TheWindhamEagle) – another place to interact directly with us. 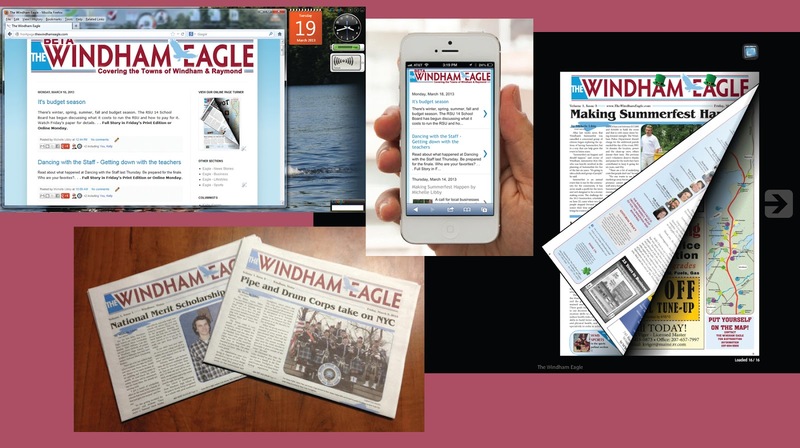 Oh yes, in closing, The Windham Eagle is all about Windham, Raymond and RSU14 – Our Community! A planned guide that has precise media related to recent activities, is made up of articles новини за about general in addition to beneficial subject areas and possesses ads usually related to just about all areas in addition to companies is mentioned as classifieds.